Mt. Takatori (鷹取山) is 139m high mountain located in Miura Peninsula. It was used to be a stone mine until the end of Taisho period. 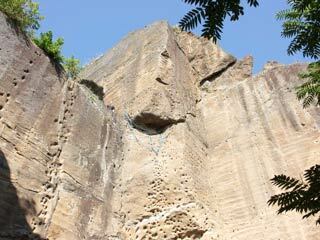 Because it was used to be a mine, there are many interesting cliffs in this mountains, and today it is a popular rock climbing spot in Kanagawa. There are also many hiking courses, and 10m Buddha statue is on the hiking course. There is an observatory which has great view of Miura Peninsula, Tokyo Bay and Boso Peninsula. The rock cliffs of Mt. Takatori is very soft. Stay away from the restricted area because it is very dangerous. When you enjoy rock climbing, make sure you are with a professional or a highly experience person. The any accidents is on your own responsibility.